Are you new to researching your African American ancestors? Do you study or teach African American history? Are you a scholar who wants to learn how to dig deeper into historical records for studying African American family units and communities? This event is co-sponsored by the CSUF Department of History’s Digital History Initiative as a collaborative effort to develop digital literacy skills among history students. If your African American ancestors lived in the U.S. by 1940, researching them back to the Reconstruction era involves the same techniques required for researching any group of people with family here during this same period of time. We will touch on those key building block techniques and record collections applicable to family history in general, as well as collections of particular interest to African Americans. Not all African Americans arrived in the U.S. during the slavery era, but a significant number did. The manner in which the legal and social structure of that time treated slaves presents significant challenges to those trying to research their slave-era ancestors of African descent. Those challenges should not dissuade you! Tracing your slave-era relatives is not an impossible task. We will discuss some strategies for success. 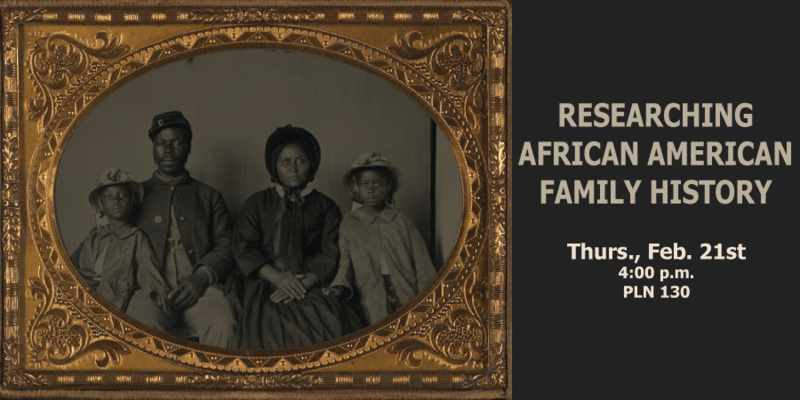 Although the scope of this lecture focuses on African Americans, the record collections and research methodologies presented are applicable to anyone who had ancestors in the U.S. by 1940, who wants to get started researching their family history. Even seasoned family historians should walk away with a few new tools and strategies.